You have no idea what I’m on about, do you? Check out the theme song from the Banana Splits … ah I love that song, although seriously … the creators of this show must have tripped on acid when they made this for kids. Whatever they were on, it certainly wasn’t protein supplements. But I’ve got something that’s definitely LOTS OF FUN FOR EVERYONE who loves their protein desserts. I’ve wanted to create a nostalgic banana split protein thing for ages … and so here it is, folks. If you would like to have some banana split but with less carbs, more protein and maybe a little less fat in the bargain, this is for you. Assemble the dessert and you’ve got banana, crunchy peanuts, vanilla creaminess, strawberries, and dark dark chocolate … all the essentials for a banana split (the dessert, not the weird TV show). I’ve used yoghurt in place of the vanilla ice-cream, just because it tastes so tangy fantastic. If you use yoghurt, make sure to choose a thick, tub-set yoghurt. You can, of course, make some vanilla protein ice-cream, or use a ricotta, cottage cheese, or quark cream filling, or even a casein cream. I think the yoghurt tang goes really well with the vanilla, berries, banana, and chocolate. Whatever you like best, it’s all good. 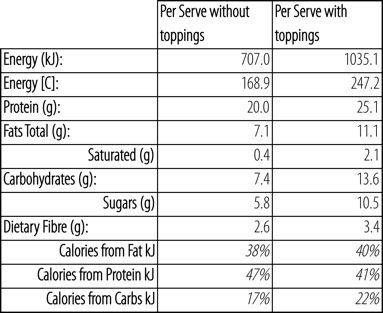 Note the absence of added sugars … make sure your bananas are super ripe and you have all the sweetness you need. I had this as my New Year’s Eve post workout breakfast this morning … whooaaaa. 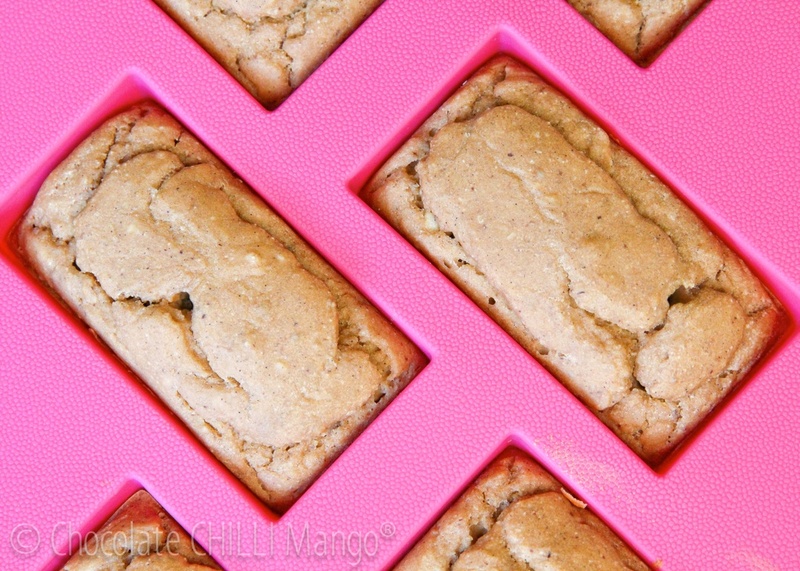 The banana blondies are banana-y sweet, soft, and moist. A great substitute for the banana in the banana split! 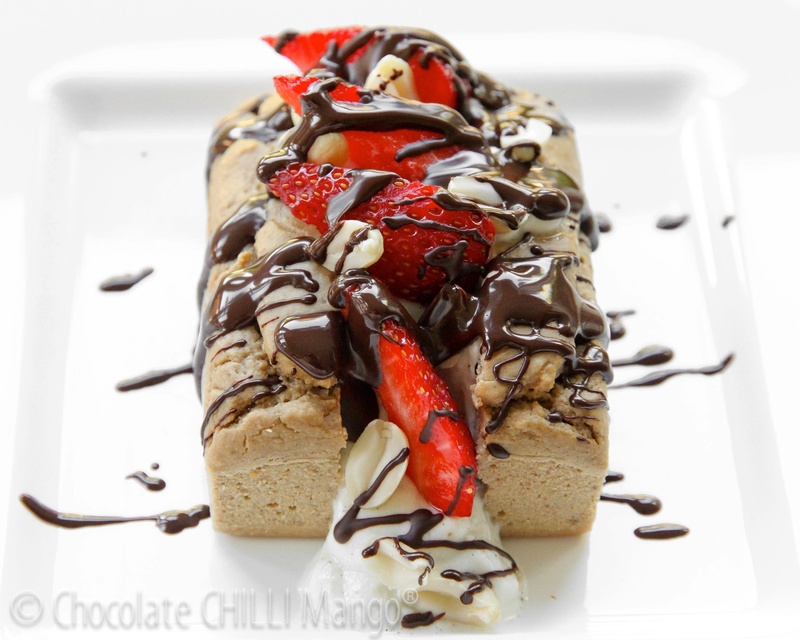 The vanilla yoghurt gives a lovely tangy contrast to the sweetness of the bars. You get the crunch of peanuts, luscious strawberry, and OH. MY. SWEET. LORD. topped off with some dark chocolate that hardens as it sets. Snap. Textures, flavours. Happy New Year! Wishing you all the very best for 2012 … be healthy, be fit, love life. Macros are included, of course. I’ve included them for the banana blondies on their own as well as with the toppings I’ve used. You’re getting two awesome snacks for the price of one here, people. Rejoice! Preheat the oven to 160℃. Have ready 6 silicon bar molds or bar tins. You can use standard muffin tins if you don’t have bar tins. If not using silicon molds, spray each tin with a little rice bran oil spray and line with a strip of non-stick baking paper to run along the base and up the sides. This will help you ease them out of the molds. You can even use an 18cm square cake tin as well and cut the cake into six bars when cooled. Set aside. Slice the banana thinly and place into a large mixing bowl with the egg whites. Using the whisk attachment, whisk at low-medium speed until the egg whites are foamy and the banana slices have broken down in the mixture. Increase the speed and whisk until the banana-egg white mixture is thick. In a separate bowl, mix together the rice protein powder, almond meal, and baking powder. Add to the egg whites, together with the vanilla. Whisk at medium speed until the batter is smooth and light. Divide the batter between the bar molds. Bake for about 20 – 25 minutes until risen, golden, and cooked. Be careful not to overbake. Transfer the molds to a wire rack and leave to cool completely in the molds. When cooled, remove to serving plates or store in an airtight container in the refrigerator for up to 5 days or so. Slice each bar in half lengthwise. Arrange on a plate, leaving a gap in the middle. The banana bars replace the banana in a traditional banana split. Stir the vanilla into the yoghurt until well mixed. 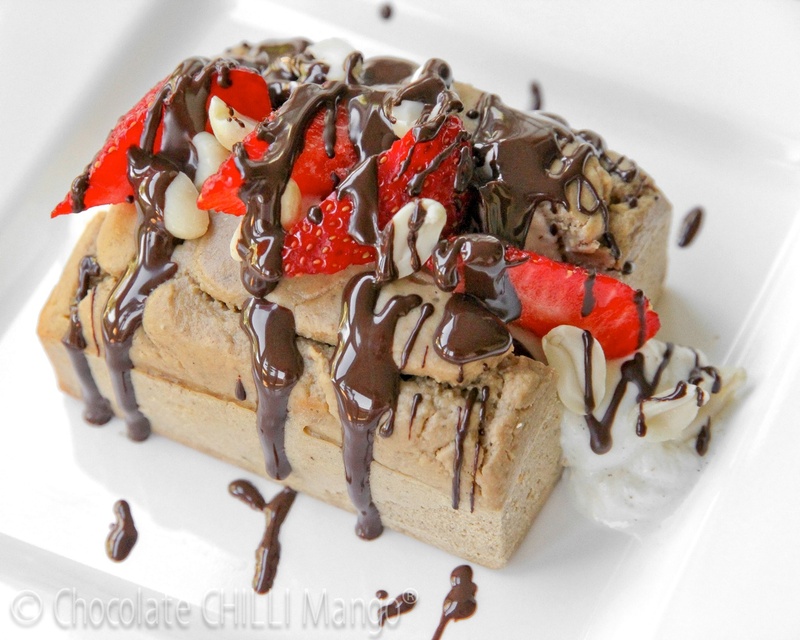 Scoop about 60 grams of vanilla yoghurt into the gap of each banana split bar. Slice the strawberries into quarters and arrange on top of the yoghurt. Sprinkle with the chopped peanuts. Melt the chocolate in a microwave or in a bowl over simmering water. Drizzle the melted chocolate over each banana split. Serve immediately. The chocolate sets and hardens and them shazam! All macros are based on available averages for fresh goods. Macros for the rice protein are based on SunWarrior unflavoured protein (as indicated in the link, above). Macros for the yoghurt are based on Barambah Organics Low-Fat Plain Yoghurt, which are pretty close to average values for non-fat yoghurt (it’s < 0.1% fat).